Some people think all they have to do is put some seeds on the ground and their food plot will take right off, eventually leading them to the giant whitetails they see on TV. It sure would be nice if it were that easy. Growing productive food plots isn’t difficult. But there is more to it than taking a bag of Frigid Forage into the woods with you. Here are four common food plot mistakes. You hear about this over and over, almost to the point of nausea. There’s a reason for it. If your soil doesn’t have the proper pH, crops are not going to grow well there. In an interview with foremost hunting.com, Todd Stittleburg of Antler King summed up the pH problem with a simple analogy. “If you and I had a steak in front of us, yet we didn’t have oxygen to breathe, it doesn’t matter how nice of a steak that is, we’re gonna die.” In most whitetail havens, soil is too acidic. If pH levels are low, lime is needed to balance the pH. Planning where the food plot should go is just as important as what you put in the food plot. Is the plot intended solely as a forage base? Is it a hunting plot? Either way giving deer some privacy when they’re feeding is a good idea. If your plots are visible from roadways, mature bucks will often wait until dark to use them, which makes it tough to hunt them. If they do use it during daylight hours, they could be spotted from the road. This just invites unscrupulous folks to trespass. Come up with a solid strategy for where & when plots will be planted on your property. Some people like to put plots where they generally don’t see a lot of deer in hopes of drawing them to that area. On small properties, that may be your only choice. In my opinion it’s a lot easier to get deer to stay where they already want to be with food than it is to get them to go somewhere else with food. Before laying down any seed, be sure to measure the plot. If you put down too much seed, not only are you throwing away money, you’re drastically reducing the amount of potential your plot has. There is only so much space and nutrient content in the soil. Overcrowded plants are stunted. You may not notice it much with something like clover. But beans, corn, and peas really lose value when overcrowded. Pro Tip For Spreading Small Seeds- When planting small seeds like turnips or radishes, you can mix the seed with milorgamite(?sp) with a ratio of 1 cup of seed to 3-4 cups of milorgamite and mixing thoroughly. 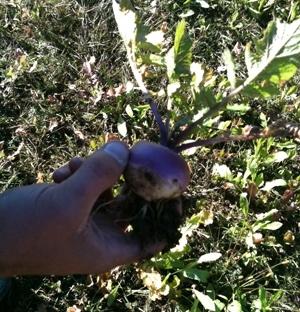 This will give you better plant spacing and bigger turnips or radishes. It would be really nice if you could just plant it and be done. And there is something to say about leaving the plot alone to avoid spooking deer. But sometimes fertilizer or herbicide is needed to maximize growing potential. If you have clover, you should mow it to keep it short. Deer don’t like long, tall stems. They like young, lush growth. Planting food plots can be a big boost to local deer populations. But like anything else, there is a right way and a wrong way. For best results, don’t cut any corners.